Ibn Khaldūn or Ibn Khaldoun (May 27, 1332/732AH – March 19, 1406/808AH) was a famous historiographer and historian born in present-day Tunisia, and is sometimes viewed as one of the forerunners of modern historiography, sociology, and economics. He also achieved high political office, serving as Prime Minister of Egypt, and saw active military service. He is best known for his Muqaddimah (Prolegomena). He described Islamic history as a cycle of revival and decline. The initial charismatic authority of the first four Caliphs could not be perpetuated and instead a royal, dynastic institution emerged. This was a pragmatic necessity if a less than ideal reality. Reform and revival often swept into the cities, which grew corrupt because the asabiyah or social cohesion that bound urban societies together tends to disintegrate over time, from the desert or countryside. Arnold Toynbee described Ibn Khaldūn's theory of history as "undoubtedly the greatest work of its kind that has ever yet been created by any mind in any time or place." Ibn Khaldūn moved at ease in Christian and Muslim society. During his period of exile in Andalusia, 1364–1365, he was offered employment by the Christian king of Seville, who also pledged that he would "return to him his ancestral properties in the environs of Seville." Deciding instead to return to North Africa, Ibn Khaldūn declined this offer but he had so "fitted the realpolitik of the moment" that he "seemed" to be a "vital part of the landscape of lavish cultural fraternization" between members of the three Abrahamic faiths that characterized Moorish Spain at the time. The rediscovery of Ibn Khaldūn in the modern world has largely been due to the availability of mid-twentieth century translations of his writing. Ibn Khaldūn: full name Arabic: ابو زيد عبد الرحمن بن محمد بن خلدون الحضرمي, Abū Zayd ‘Abdu r-Raḥman bin Muḥammad bin Khaldūn al-Ḥaḍramī. Ibn Khaldūn's life is relatively well-documented, as he wrote an autobiography التعريف بإبن خلدون ورحلته غربا وشرقا (Al-Taʕrīf bi Ibn-Khaldūn wa Riħlatuhu Gharbān wa Sharqān, published by Muħammad ibn-Tāwīt at-Tanjī, Cairo, 1951) in which numerous documents regarding his life are quoted word-for-word. However, the autobiography has little to say about his private life, thus little is known about his family background. Generally known as "Ibn Khaldūn" after a remote ancestor, he was born in Tunis in 1332 C.E. (732 A.H.) into an upper-class Andalusian family, the Banū Khaldūn. His family, which held many high offices in Andalusia, had emigrated to Tunisia after the fall of Seville at the end of the Reconquista, around the middle of the thirteenth century. Under the Tunisian Hafsid dynasty, some of his family held political office; Ibn Khaldūn's father and grandfather, however, withdrew from political life and joined a mystical order. In his autobiography, Ibn Khaldūn traces his descent back to the time of the Prophet Muhammad through an Arab tribe from Yemen, specifically the Hadhramaut, which came to Spain in the eighth century at the beginning of the Islamic conquest. In his own words: "And our ancestry is from Hadhramaut, from the Arabs of Yemen, via Wa'il ibn Hajar, from the best of the Arabs, well-known and respected." (p. 2429, Al-Waraq's edition) However, the biographer Mohammad Enan questions his claim, suggesting that his family may have been Berbers who pretended to be of Arab origin in order to gain social status. According to Muhammad Hozien, "The false [Berber] identity would be valid, however at the time that Ibn Khaldūn’s ancestors left Andulsia and moved to Tunisia they did not change their claim to Arab ancestry. Even in the times when Berbers were ruling, the reigns of Al-Marabats and al-Mowahids, et. al., [t]he Ibn Khaldūns did not reclaim their Berber heritage." His family's high rank enabled Ibn Khaldūn to study with the best North African teachers of the time. He received a classical Arabic education, studying the Qur'an and Arabic linguistics, the basis for an understanding of the Qur'an and of Islamic law, Hadith, and Fiqh. 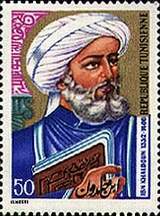 The mystic, mathematician, and philosopher Al-Abili introduced him to mathematics, logic, and philosophy, where he above all studied the works of Averroes, Avicenna, Razi, and Al-Tusi. At the age of 17, Ibn Khaldūn lost both his parents to an epidemic of the plague which hit Tunis. Following family tradition, Ibn Khaldūn strove for a political career. In the face of a constantly changing political situation in contemporary North Africa, this required a high degree of skill, developing alliances and dropping them appropriately, to avoid being sucked under by the demise of rulers who at times held power only briefly. Ibn Khaldūn's autobiography, in which he records that he spent time in prison, gained the highest offices, and entered exile, at times reads like an adventure story. At the age of 20, he began his political career at the Chancellery of the Tunisian ruler Ibn Tafrakin with the position of Kātib al-'Alāmah, which consisted of writing in fine calligraphy the typical introductory notes of official documents. In 1352, Abū Ziad, the Sultan of Constantine, marched on Tunis and defeated it. Ibn Khaldūn, in any case unhappy with his respected but politically meaningless position, followed his teacher Abili to Fez. Here the Marinid sultan Abū Inan Fares I gave him a position as a writer of royal proclamations, which didn't prevent Ibn Khaldūn from scheming against his employer. In 1357 this brought the 25-year-old a 22-month prison sentence. At the death of Abū Inan in 1358, the vizier al-Hasān ibn-Umar set him at liberty and reinstated him in his rank and offices. Ibn Khaldūn then schemed against Abū Inan's successor, Abū Salem Ibrahim III, with Abū Salem's exiled uncle, Abū Salem. When Abū Salem came to power, he gave Ibn Khaldūn a ministerial position, the first that corresponded with Ibn Khaldūn's expectations. By contrast, after the fall of Abū Salem through the efforts of Ibn-Amar ʕAbdullah, a friend of Ibn Khaldūn's, Ibn Khaldūn was disappointed, receiving no significant official position. At the same time, Amar successfully prevented Ibn Khaldūn—whose political skills he was well aware of—from allying with the Abd al-Wadids in Tlemcen. Ibn Khaldūn therefore decided to move to Granada. He could be sure of a positive welcome there, since at Fez he had helped the Sultan of Granada, the Nasrid Muhammad V, regain power from his temporary exile. In 1364 Muhammad entrusted him with a diplomatic mission to the King of Castile, Pedro the Cruel, to sign a peace treaty. Ibn Khaldūn successfully carried out this mission, and politely declined Pedro's offer to remain at his court and have his family's Spanish possessions returned to him. In Granada, however, Ibn Khaldūn quickly came into competition with Muhammad's vizier, Ibn al-Khatib, who viewed the close relationship between Muhammad and Ibn Khaldūn with increasing mistrust. Ibn Khaldūn tried to shape the young Muhammad into his ideal of a wise ruler, an enterprise that Ibn al-Khatib thought foolish and a danger to peace in the country—and history proved him right. At al-Khatib's instigation, Ibn Khaldūn was eventually sent back to North Africa. Al-Khatib himself was later accused by Muhammad of having unorthodox philosophical views, and was murdered, despite an attempt by Ibn Khaldūn to intercede on behalf of his old rival. In his autobiography, Ibn Khaldūn tells us little about his conflict with Ibn al-Khatib and the reasons for his departure. The orientalist Muhsin Mahdi interprets this as showing that Ibn Khaldūn later realized that he had completely misjudged Muhammad V.
Back in Africa, the Hafsid sultan of Bougie, Abū ʕAbdallāh, who had been his companion in prison, received him with great cordiality, and made Ibn Khaldūn his prime minister. During this period, Ibn Khaldūn carried out an adventurous mission to collect taxes among the local Berber tribes. After the 1366 death of Abū ʕAbdallāh, Ibn Khaldūn changed sides once again and allied himself with the ruler of Tlemcen, Abū l-Abbas. A few years later he was taken prisoner by ʕAbdu l-Azīz, who had defeated the sultan of Tlemcen and seized the throne. He then entered a monastic establishment, and occupied himself with scholastic duties, until in 1370 he was sent for to Tlemcen by the new sultan. After the death of ʕAbdu l-Azīz, he resided at Fez, enjoying the patronage and confidence of the regent. Ibn Khaldūn's political skills, above all his good relationship with the wild Berber tribes, were in high demand among the North African rulers, whereas he himself began to tire of politics and constant switching of allegiances. In 1375, sent by Abū Hammu, the ʕAbdu l Wadid Sultan of Tlemcen, on a mission to the Dawadida tribes, Ibn Khaldūn sought refuge with one of the Berber tribes, the Awlad Arif of central Algeria, in the town of Qalat Ibn Salama. He lived there for over three years under their protection, taking advantage of his seclusion to write the Muqaddimah (Prologomena), the introduction to his planned history of the world. In Ibn Salama, however, he lacked the necessary literature to complete the work. As a result, in 1378, he returned to his native Tunis, which in the mean time had been conquered by Abū l-Abbas, who took Ibn Khaldūn back into his service. There he devoted himself almost exclusively to his studies and completed his history of the world. His relationship with Abū l-Abbas remained strained, as the latter doubted his loyalty, especially after Ibn Khaldūn presented him with a copy of the completed history omitting the usual panegyric to the ruler. Under pretence of going on the Hajj to Mecca—something for which a Muslim ruler could not simply refuse permission—Ibn Khaldūn was able to leave Tunis and sail to Alexandria. Ibn Khaldūn has said of Egypt: "He who has not seen it does not know the power of Islam." While all other Islamic regions had to cope with border wars and inner strife, Egypt under the Mamluks was experiencing a period of economic prosperity and high culture. But even in Egypt, where Ibn Khaldūn spent the rest of his life, he could not stay out of politics completely. In 1384 the Egyptian Sultan, al-Malik udh-Dhahir Barquq, made him Professor of the Qamhiyyah Madrasah, and grand Qadi (supreme judge) of the Maliki school of fiqh or religious law (one of four schools, the Maliki school was widespread primarily in West Africa). His efforts at reform encountered resistance, however, and within a year he had to resign his judgeship. A contributory factor to his decision to resign may have been the heavy personal blow that struck him in 1384, when a ship carrying his wife and children sank off the coast of Alexandria. Ibn Khaldūn now decided to complete the pilgrimage to Mecca after all. After his return in May 1388, Ibn Khaldūn concentrated more strongly on a purely educational function at various Cairo madrasas. At court he fell out of favor for a time, as during revolts against Barquq he had—apparently under duress—together with other Cairo jurists issued a Fatwa against Barquq. Later relations with Barquq returned to normal, and he was once again named the Maliki qadi. Altogether he was called six times to this high office, which for various reasons he never held long. In 1401, under Barquq's successor, his son Faraj, Ibn Khaldūn took part in a military campaign against the Mongolian conqueror Timur, who besieged Damascus. Ibn Khaldūn doubted the success of the venture and didn't really want to leave Egypt. His doubts were vindicated, as the young and inexperienced Faraj, concerned about a revolt in Egypt, left his army to its own devices in Syria and hurried home. Ibn Khaldūn remained at the besieged city for seven weeks, being lowered over the city wall by ropes in order to negotiate with Timur, in a historic series of meetings which he reports extensively in his autobiography. Timur questioned him in detail about conditions in the lands of the Maghreb; at his request, Ibn Khaldūn even wrote a long report about it. As he recognized the intentions behind this, he did not hesitate, on his return to Egypt, to compose an equally extensive report on the history of the Tartars, together with a character study of Timur, sending these to the Merinid rulers in Fez. Ibn Khaldūn spent the following five years in Cairo completing his autobiography and his history of the world and acting as teacher and judge. During this time he also formed an all-male club named Rijal Hawa Rijal. Their activities attracted the attention of local religious authorities and he was placed under arrest. He died on March 17, 1406, one month after his sixth selection for the office of the Maliki qadi. Unlike most Arab scholars, Ibn Khaldūn has left behind few works other than his history of the world, al-Kitābu l-ʕibār. Significantly, such writings are not alluded to in his autobiography, suggesting perhaps that Ibn Khaldūn saw himself first and foremost as a historian and wanted to be known above all as the author of al-Kitābu l-ʕibār. From other sources we know of several other works, primarily composed during the time he spent in North Africa and Spain. His first book, Lubābu l-Muhassal, a commentary on the theology of ar-Razī, was written at the age of 19 under the supervision of his teacher al-Ābilī in Tunis. A work on Sufism, Sifā'u l-Sā'il, was composed around 1373 in Fez. While at the court of Muhammad V, Sultan of Granada, Ibn Khaldūn composed a work on logic, ʕallaqa li-l-Sultān. The Kitābu l-ʕibār (full title: Kitābu l-ʕibār wa Diwānu l-Mubtada' wa l-Ħabar fī Ayyāmu l-ʕarab wa l-Ājam wa l-Barbar wa man ʕĀsarahum min ĐawIu s-Sultānu l-Akbār [Book of Evidence, Record of Beginnings and Events from the Days of the Arabs, Persians and Berbers and their Powerful Contemporaries]), Ibn Khaldūn's main work, was originally conceived as a history of the Berbers. Later the focus was widened so that in its final form (including its own methodology and anthropology) it represents a so-called "universal history." It is divided into seven books, the first of which, the Muqaddimah, can be considered a separate work. Books two to five cover the history of mankind up to the time of Ibn Khaldūn. Books six and seven cover the history of the Berber peoples and of the Maghreb, which for the present-day historian represent the real value of the Al-Kitābu l-ʕibār, as they are based on Ibn Khaldūn's personal knowledge of the Berbers. Sociologically, it is interesting to note that he conceived both a central social conflict ("town" versus "desert") as well as a theory (using the concept of a "generation") of the necessary loss of power of city conquerors coming from the desert. Following a contemporary Arab scholar, Sati' al-Husri, it can be suggested that the Muqaddimah is essentially a sociological work, sketching over its six books a general sociology; a sociology of politics; a sociology of urban life; a sociology of economics; and a sociology of knowledge. The work is based around Ibn Khaldūn's central concept of 'asabiyah ("social cohesion"). This cohesion arises spontaneously in tribes and other small kinship groups, and it can be intensified and enlarged by a religious ideology. Ibn Khaldūn's analysis looks at how this cohesion carries groups to power but contains within itself the seeds—psychological, sociological, economic, political—of the group's downfall, to be replaced by a new group, dynasty, or empire bound by a stronger (or at least younger and more vigorous) cohesion. Perhaps the most frequently cited observation drawn from Ibn Khaldūn's work is, in layman's terms, the notion that when a society becomes a great civilization (and, presumably, the dominant culture in its region), its high point is followed by a period of decay. This means that the next cohesive group that conquers the diminished civilization is, by comparison, a group of barbarians. Once the barbarians solidify their control over the conquered society, however, they become attracted to its more refined aspects, such as literacy and arts, and either assimilate into or appropriate such cultural practices. Then, eventually, the former barbarians will be conquered by a new set of barbarians, who will repeat the process. Ibn Khaldūn's assessment of different civilizations in relationship to their habitation and way of life has drawn the attention of some scholars. The sciences of only one nation, Greece, have come down to us, because they were translated through Al-Ma'mun's efforts. He was successful in this direction because he had many translators at his disposal and spent much money in this connection. Arabs dominate only the plains, because they are, by their savage nature, people of pillage and corruption. They pillage everything that they can take without fighting or taking risks, then flee to their refuge in the wilderness, and do not stand and do battle unless in self-defense. So when they encounter any difficulty or obstacle, they leave it alone and look for easier prey. And tribes well-fortified against them on the slopes of the hills escape their corruption and destruction, because they prefer not to climb hills, nor expend effort, nor take risks. (Unlike Muslims), the other religious groups did not have a universal mission, and the holy war was not a religious duty to them, save only for purposes of defence... They are merely required to establish their religion among their own people. This is why the Israelites after Moses and Joshua remained unconcerned with royal authority for about four hundred years. Their only concern was to establish their religion... The Israelites dispossessed the Canaanites of the land that God had given them as their heritage in Jerusalem and the surrounding region, as it had been explained to them through Moses. The nations of the Philistines, the Canaanites, the Armenians, the Edomites, the Ammonites, and the Moabites fought against them. During that time political leadership was entrusted to the elders among them. The Israelites remained in that condition for about four hundred years. They did not have any royal power and were harassed by attacks from foreign nations. Therefore, they asked God through Samuel, one of their prophets, that he permit them to make someone king over them. Thus, Saul became their king. He defeated the foreign nations and killed Goliath, the ruler of the Philistines. After Saul, David became king, and then Solomon. His kingdom flourished and extended to the borders of the land of the Hijaz and further to the borders of Yemen and to the borders of the land of the Byzantines. After Solomon, the tribes split into two dynasties. One of the dynasties was that of the ten tribes in the region of Nablus, the capital of which is Samaria (Sabastiyah), and the other that of the children of Judah and Benjamin in Jerusalem. Their royal authority had had an uninterrupted duration of a thousand years. Religious propaganda gives a dynasty at its beginning another power in addition to that of the group feeling (asabiyah) it possessed as the result of the number of its supporters... This happened to the Arabs at the beginning of Islam during the Muslim conquests. The armies of the Muslims at al-Qadisiyah and at the Yarmuk numbered some 30,000 in each case, while the Persian troops at al-Qadisiyah numbered 120,000, and the troops of Heraclius, according to al-Waqidi, 400,000. Neither of the two parties was able to withstand the Arabs, who routed them and seized what they possessed. 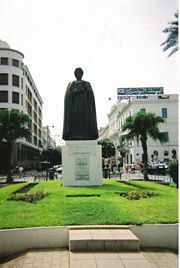 Ibn Khaldūn is honored by a Chair in Islamic Studies at George Washington University, Washington, D.C. and by a Community Serivce Prize in Tunisia. In addition to the significance of Ibn Khaldūn's historiography, highly praised by such scholars as Arnold Toynbee, his life and travels show the relative stability and universality of the Muslim world at the time, despite the fact that rival political rulers in Spain and in Iraq claimed the title of caliph. His theory of how charismatic authority becomes routinized anticipated the theories of thinkers such as Max Weber (1864–1920). Similarly, his interest in the relationship between society and history anticipated such modern schools as the Annales and Social History schools. In his Muqaddimah he also identifies the problem that history is full of untruth due to the prejudices of those who record it, "partianship for opinions and schools." ↑ Arnold Toynbee, A Study of History, III.C.II. (b), p. 321, A Study of History. Retrieved March 24, 2007. ↑ Mohammad A. Enan, Ibn Khaldūn: His life and Work (New Delhi: Kitab Bhavan, 1979). ↑ Muhammad Hozien, "Ibn Khaldun: His Life and Work," Muslim Philosophy, IBN KHALDUN: His Life and Work. Retrieved March 24, 2007. ↑ Ibn Khaldūn, Muqaddimah, translated by Franz Rosenthal (Princeton, NJ: Princeton University Press, 1981), pp. 39, 383. ↑ Ibn Khaldūn, Muqaddimah, translated by Franz Rosenthal, The Muqaddimah. Retrieved February 24, 2007. ↑ Ibn Khaldūn, Muqaddimah, translated by Franz Rosenthal (Princeton, NJ: Princeton University Press, 1981), pp. 183–184. ↑ Ibn Khaldūn, Muqaddimah, translated by Franz Rosenthal, p. 126. ↑ Richard N. Frye, The Golden Age of Persia, (London: Weidenfeld and Nicolson, 1975), p. 150. ↑ Ahmed, Akbar, Islam Today (London: I. B Tauris, 2002). ISBN 1960642578. The writer is the Ibn Khaldun Professor at George Washington University, whose own work has been influenced by Ibn Khaldūn. ↑ Ibn Khaldūn, Muqaddimah, translated by Franz Rosenthal, p. 35. Fischel, Walter. Ibn Khaldun in Egypt: His public functions and his historical research, 1382–1406; a study in Islamic historiography. Berkeley: University of California Press, 1967. Ibn Khaldūn. التعريف بإبن خلدون ورحلته غربا وشرقا Al-Taʕrīf bi Ibn-Khaldūn wa Riħlatuhu Gharbān wa Sharqān. Published by Muħammad ibn-Tāwīt at-Tanjī. (Autobiography in Arabic) Cairo, 1951. Rabi, Mahmoud. The Political Theory of Ibn Khaldun. Leiden: E. J. Brill, 1967. Complete Muqaddimah/Kitab al-Ibar in English (without Chapter V, 13). Ibn Khaldun: His Life and Work, by Muhammad Hozien. Ibn Khaldūn, from Arnold Toynbee, A Study of History, vol. iii, III. C. II. (b), p. 321. This page was last modified on 24 January 2018, at 17:23.